The UWUA is making significant progress in its California campaign to improve gas system safety and integrity in both the legislative and regulatory arenas in the past year. The status quo of a leaky, antiquated system is no longer what California is about. 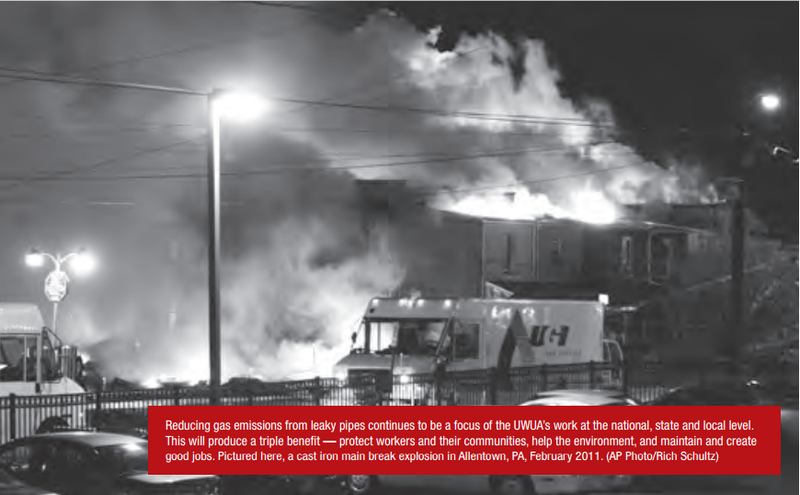 The UWUA sponsored and led the effort to enact the nation’s first comprehensive legislation to reduce methane emissions from the gas transportation and delivery system by systematically reducing the incidence of leaks. Senate Bill 1371, by Senator Mark Leno, was signed into law by Governor Jerry Brown in September 2014 and became one of the Governor’s showpieces when he attended the Climate Summit in New York. This followed the UWUA’s successful legislative initiative in 2011 establishing an absolute legal priority for safety in the operation of the gas system, informed by ongoing input from union workers in the field (Senate Bill 705). 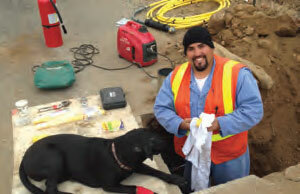 The 2014 legislation requires the utilities and the California Public Utilities Commission (CPUC) to develop comprehensive reporting of leaks, causes of leaks and emissions from leaks; to review existing operation and maintenance practices to see if they are effective in reducing leaks; and to develop best practices for avoiding, reducing and repairing leaks promptly. Implementing that statute at the California Public Utilities Commission during 2015 has been a consuming task of Local 132. Union efforts led the commission to hold a rare en banc hearing in September, where all five commissioners sat to hear presentations about safety and pipeline integrity from the utilities and the unions representing utility workers. Local 132 Business Agent Eric Hoffman makes a convincing argument to the California Public Utilities Commission for worker input in policy and ratemaking. 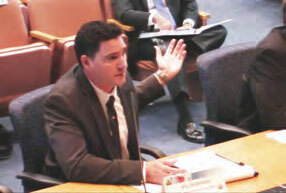 UWUA spokesperson Eric Hofmann, business agent for Local 132 (representing gas workers in Southern California), made an effective case for the value of direct worker input in policy and ratemaking cases. The CPUC’s senior managers invited him, UWUA staff, and representatives of IBEW Local 1245 representing Northern California gas workers, to a follow-up meeting to discuss how to make regular communication with workers a more significant aspect of the CPUC’s processes. The implementation proceeding will focus on developing best practices to avoid, reduce and promptly repair leaks on the storage, transmission and distribution pipelines, in order to reduce hazards and reduce emissions. The statute requires specific improvements in patrol, leak survey and leak survey technologies. It requires repair of leaks as soon as possible after discovery. The UWUA and IBEW are cooperating closely to achieve a consistent approach that will benefit the public and the environment, and will truly represent the best work that skilled and dedicated UWUA members can achieve. This must include, in the statute’s terms, an “adequate workforce,” both numerically sufficient and possessing the needed skills and training. At the same time, during 2015 the UWUA participated extensively in the general rate case proceeding for Southern California Gas, where the company sought nearly $3 billion to support general operation, maintenance and capital programs. While installing a new service to a customer, an unexpected friendly visitor got loose from his home and decided to take a nap next to local 132 Crew Leader Alex Salazar. In the face of determined efforts from so-called consumer advocate organizations to cut necessary operating and maintenance programs, the UWUA’s support for full funding resulted in a settlement that will provide nearly 100% of the revenues requested by the utility for operation, maintenance and capital for storage, transmission and distribution functions. The company agreed to cuts for some customer service functions sought by the “consumer advocate” groups, with reluctant acceptance from the union. In the aftermath of the 2010 San Bruno explosion and enactment of SB 705, the CPUC has begun to change its basic processes for setting rates for utilities. Under the old regime, the utilities and the consumer groups would focus on rate revenues and on keeping rate increases to a minimum without regard to service quality or safety results. Under the new regime, the basic issue is how to operate in a safe and reliable manner, and what are the revenues needed to achieve safe and reliable service. The CPUC has commenced a proceeding to institutionalize these changes in a “risk-informed” process for setting rates. The UWUA and IBEW are working together to defend the basic idea that safety and quality of service are the highest priorities, as the CA statute requires, and that rates should be sufficient to provide that level of service. This proceeding is ongoing and will result in fundamental changes to the regulatory process. As one example, the ratepayer advocate group at the CPUC has for the first time (as of October 1) established a safety organization whose job is to assess utility operation and maintenance outcomes and quality. The times are indeed changing.